Home > Book Review > Reading Habit To Practice For The Week. Reading Habit To Practice For The Week. Welcome to a new week filled with so much possibilities. At the Write -Treasurez reading club, we usually pick a reading habit to practice for the week. This is aimed at helping you read that book you have been desiring to read but haven’t read it or completed reading it. 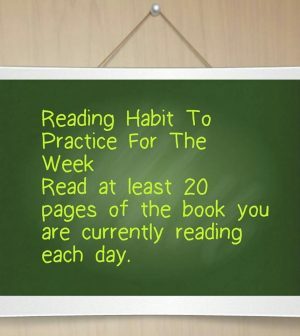 This week, here is a reading habit you can use; Read at least 20 pages of the book you are currently reading or you desire to read each day of this week. What that means is that, you can exceed 20 page limit but ensure it’s not below 20 pages each day. With this, you can cover a book of 120pages this week. Something else to keep in mind, if you exceed 20 pages in a day, do not add up the extra pages for the next day. Keep reading 20 PAGES each day. You can decide to break your reading in sessions; some pages in the morning, the rest in the evening or even in between breaks and free times. If there is a will, there would be a way. Do not let excuses stop your growth and learning process. Wishing you the best of the week. Grace Onyebuolise is a Nigerian. She studied Biochemistry at the University of Port Harcourt but her passion to read and see other read too became a career foundation for her. She runs Write Treasurez, an educational resource center that offer services as book sales, reading club, promoting books and authors, educational news and events. She writes at her spare time too but more importantly she is driven to add value to anyone she meets because that way she gets to spread the love of Jesus Christ which is the best thing that can happen to anyone.